alaTest a collecté et analysé 17 avis de consommateurs et d'experts pour le produit Morphy Richards Mattino Filter 12 Cup Coffee Maker. La note moyenne du produit est 4.7 sur 5, tandis que les autres produits de même catégorie ont une note moyenne de 4.2 sur 5. De nombreux avis apprécient le rapport qualité/prix. 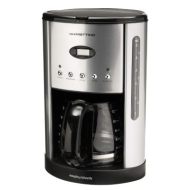 Après analyse des notes de consommateurs et d'experts, de l'âge du produit ainsi que d'autres facteurs, et comparé aux autres produits de même catégorie, le Morphy Richards Mattino Filter 12 Cup Coffee Maker obtient un alaScore™ de 82/100 = Très Bien. It's so easy to use.Having a timer is a great way to wake to the smell of freshly made coffee. Good looking machine, great tasting coffee! I ordered this after looking at various other models which were either expensive for what they were or didn't look nice enough to display in the kitchen. Asda were selling this for £10 less than RRP. Great bargain on a brand name and the coffee tastes great. Has the added plus of the hotplate. good, value for money machine! I bought this item as a replacement for my kenwood coffee maker, and to be honest i wasn't expecting it to be any where near as good!